The new man in charge of the Carolina Panthers defense is a disciple of the great Eddie Robinson. 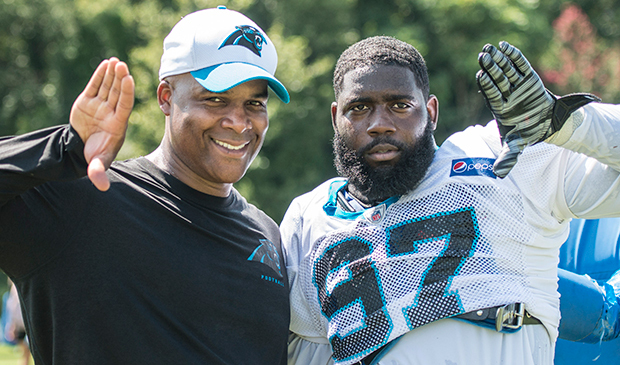 The Panthers promoted defensive line coach Eric Washington to defensive coordinator on Monday, the team announced. Washington replaces Steve Wilks, who was hired as the Arizona Cardinals coach earlier in the day. Washington has been with Carolina since Ron Rivera took over as the team’s head coach in 2011. He’s coached several Pro Bowlers, and helped the team finish as a top ten defensive squad in five of six seasons. Before he was an NFL coach, Washington played tight end at Grambling for legendary coach Eddie Robinson before getting his degree in 1993. After spending time in the military he spent a decade in the college ranks from 1997 to 2007 at Texas A&M, Ohio and Northwestern before working his way up to defensive line coach with the Chicago Bears. The Panthers, obviously, think pretty highly of Washington. That includes players like Mario Addison as well as the coaching staff.